Coaching Specialties: Looking for a Coach who Specializes in a certain subject? Coach vs Mentor. 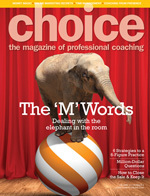 This section contains a brief description of the most common coaching specialties. It is important to note that CLI's Power Coaching® tools are universal. In other words they can be used in all areas of life. For example, in one session, the Power Coach® may be working to assist you in the achievement of leadership goals. In the next session, they may be assisting you in better communicating with your spouse. The Power Coach's #1 job is to create an environment where you can develop your own innovative solutions to challenges and goals. With permission from you, the Client, they can mentor if it is required. More often then not, the Power Coaching tools open up the Client's innovative thinking to such a degree that they are in no need of additional ideas. Some Clients request a Coach who "specializes" in a certain subject. In this case the Client is looking for a "Mentor" vs a Coach - someone who has knowledge and experience in that subject. Mentoring is about sharing wisdom. Coaching is about assisting the Client in developing their own solutions. It is an honourable job and a most gratifying one!